When immortal Lachlan MacAlpin pulls a 20th century American woman from Loch Ness in 1566, he thinks he has found his true love, the fulfillment of a prophecy. Reprint. Pam Binder says she believes in happier-ever-after endings. Married 32 years, with three grown kids, she has had a good life with an understanding mate, one who has supported her lifelong writing habit. "I've always loved to write." says Pam, an Issaquah, Washington resident and office manager at Chinook Middle School. "Poetry, short stories...I cannot remember a time when I didn't like to write or read." Binder's path to her destiny was circuitous. As she raised her children, she put her writing career on hold. But old-fashioned diligence and a chance meeting with a receptive agent, changed her life. When Pam Binder was a kid, a fifth grade teacher told her mother: "Pam's reading too much. She's reading during recess." Her mother retorted that she didn't consider her daughter's love of reading grounds for complaint. About ten years ago, Pam decided she wanted to start writing again in earnest. She went to a Romance Writers of America conference. Then she signed up for the commercial fiction writing sequence at the University of Washington's extension division. It was there that things fell into place. 1)The Quest -- the physical or emotional journey taken by the protagonist. 2)The Dragon -- the conflict the main character must endure, or surmount. 3)A resolution that comes back to the beginning of the hero's quest. Pam learned that a story is "not a straight line, but a circle." When a character returns to his or her starting point "they're completely different, emotionally transformed." "It was like a light bulb went off," Pam said. After traveling to Scotland on vacation with her husband, a story fermenting in her imagination suddenly came together and began to gel. 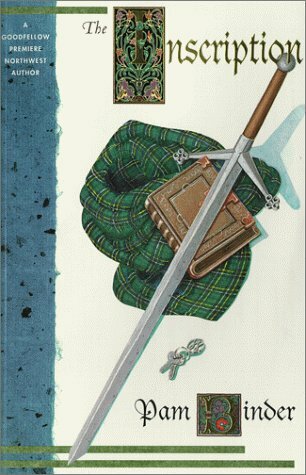 The result was The Inscription, a time travel romance set in 16th century Scotland. Her book features a clan of immortals and a modern American teacher named Amber MacPhee who is pulled into their world of mystery, romance and adventure. Pam's next class at the University was taught by the owner of a small regional press. P.R. Goodfellow bought Pam's work-in-progress, printed 2,000 copies of it in 1997 and sold them all. If that were the end of the story, this would be a respectable happier-ever-after piece. It's not. In 1998, Pam took the Goodfellow Press edition of The Inscription to the Pacific Northwest Writers' Association summer conference. More or less at random, Binder took the book to Liza Dawson, a New York literary agent. Dawson "patted my hand," Pam recalls, took the book on the plane and called her Monday morning. "I can sell this," Dawson told Pam. Dawson says she has a test for any book: "Am I having a really, really good time?" She recalls her immediate reaction to The Inscription: "I so much enjoyed reading that book. It's a bear of a trip from Seattle to Newark. I found myself laughing, enjoying it...it came as a surprise because I hadn't had any expectations." Though Dawson enjoys mixing with authors at such conferences, finding a saleable one is a relatively rare event. 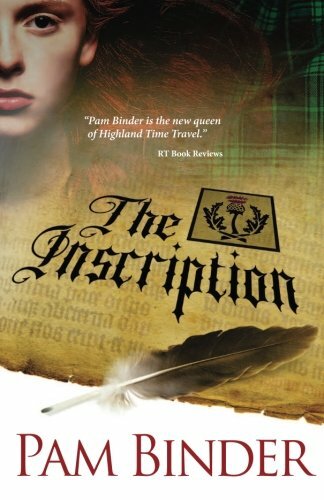 Dawson sold The Inscription and another book by Pam Binder, The Quest, to Pocket. The Quest will be released in August 2000 under Pocket/Sonnet. It is also a time travel: A Celtic sorceress needs a warrior to free her mother; however, when she cast a spell, the man who appears is, Kenneth MacKinnon, a professional football player from the 21st century. For the first time in his life he is not in control of the situation. What is this lesson in this happy ending? Endurance, perhaps. Pam says she has a quality that approximates the "cone of silence" of Maxwell Smart on the old Get Smart television show -- she can block out anything and write anytime, everywhere. Writing on a regular legal pad, she writes during her lunch break. After work, she goes to Barnes & Noble and writes there. She credits her UW instructors for teaching her that you don't have to write in sequence. Write an adventure sequence when you feel like it -- write romance when the spirit moves you. In fact, not a lot has changed since that fifth-grader was chastised for reading during recess. Pam's need to read and write endures. "I look at it as small steps", she says. "As a writer, you need to look at the long term." 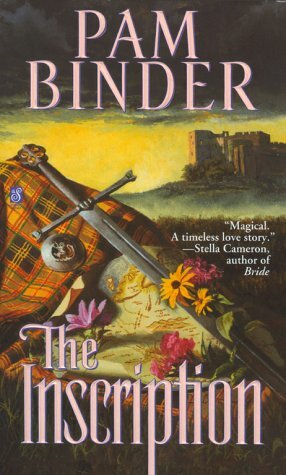 The Inscription received 4 and a half stars and a Romantic Times Top Pick award in their February Review: "...Readers will be drawn in by Pam Binder's magic touch for blending the natural with the supernatural and creating a spellbinding tale with many subplots, wonderful historical backdrop and color, and the added attraction of the Highlander immortal. This is truly a love story for the ages." Once again the mournful wail of bagpipes, followed by a woman's cry for help, had awakened the laird of Urquhart Castle from a sound sleep and drawn him to the mist-shrouded waters of Loch Ness. In the light of the full moon the calm waters glistened like a newly forged sword as he made his way down the path to the shore. The image of the woman who had of late occupied his dreams came unbidden to his mind. Her hair, the color of burnished gold, hung past her shoulders and the sadness reflected in her eyes made him wonder the cause. Lachlan MacAlpin did not know who she was, only that over the past few days her likeness had lingered in his thoughts well after he was fully awake. Each night this past seven days he had ventured out into the cool air, at first to escape his dreams, and then to pursue them. But tonight would be different. He could feel it. The haunting music of the bagpipes returned. It was the same tune as the one in his dreams. He felt the hair prickle on the nape of his neck. The sound could be from a lone piper in the Highlands overlooking the loch. He gripped the hilt of his sword. Waves began to foam to life, crashing against the stone walls of his castle as a shadow moved under the water. He was not afraid of the beastie that lived in the black depths of the loch; it was guardian to his people. But the creature only ventured near the surface when summoned, or when danger threatened those it protected. He knew it was not by chance the Guardian was near. There was a purpose, and as leader he must learn if its appearance was connected to his dreams. Lightning cracked across the sky and he heard a faint cry for help through the increasing tempo of the bagpipes. There had been a time when he could have ignored such a plea for aid, but that was before he had left those he loved to the mercy of his enemy. The call came again, clear and insistent. He turned toward it. Not far from where he stood he could see someone in the water. A woman. Her cry rose above the growing storm as she fought to stay on the surface of the loch. His premonition had borne fruit, but fate had a way of destroying hope. Lachlan hastened to remove his sword and tossed it onto the rock ledge. Plunging into the angry waters, he felt the bottom of the loch drop off abruptly to its unknown depths. His pulse quickened as he saw her pulled beyond his reach. Frustration filled him. How fragile life was for these mortals. He was weary of death and longed to become like his sword, strong, emotionless, and unfeeling. He dove under the water in search of her, but could see little in the murky blackness. Death would not claim this one, he vowed. Surfacing, he saw her only a short distance from him. She was gasping for air. Lightning split the sky and illuminated her face. He lunged toward her. Her long hair and the garments she wore tangled around him. The fear in her eyes disappeared when she reached for him and clung to his neck. Time held its breath. He wrapped his arms around her slender waist before the icy currents dragged them both under the surface. The numbing cold surrounded him. His lungs burned and the current tried to pull her from his grasp. He held on. She could not survive without his help. Fighting the power of the loch, he kicked free of its hold and broke the surface. He held her head above the waves and swam until he could touch the bottom. Lachlan stood, shuddering as the crisp wind lashed across his wet skin. She lay cold and still in his arms. Her eyes were closed and her hair was draped over the silken garment that clung to her body. His breath caught in his throat. She was the image of the woman in his dreams. He removed his shirt and wrapped it around her. Reaching for his sword, he slung it over his shoulder and then gently cradled her against him. She shivered in his arms. It felt as though she had molded her body to his. Cold rain began to fall as he hurried toward the warmth of the castle. This woman from the loch must not die. She had placed her life in his hands. The weight of that responsibility was familiar. His people relied on his wisdom and strength, from the approval of marriage to the fate of anyone who broke their laws. He called an order to the gatekeeper, who ran to obey. The massive door creaked open and torches on the inner walls cast gray shadows as he headed toward the side entrance. His voice broke through the silence once more and thundered with authority. "Una. I am in need of your help." He knew his longtime friend would be awake as she slept little these days. As he adjusted the woman in his arms, he could feel the shallow breathing against his chest. "Rest easy, lass, you are safe." She nestled closer and a wave of protectiveness washed over him. The strength of his reaction surprised him. Lachlan kicked open the door to the cookroom. Una was busy wiping down a long trestle table. Wisps of gray hair framed her face as she bent over her task. She turned slowly toward him. He heard her sharp intake of breath as she put the cloth down and wiped her hands on her apron. Una shuffled over to him and touched the woman's face. "She lives, but death chases her soul. 'Tis a long time since you have brought a lost one to my door. Where was she found?" Una paused. "The black water claims many who enter its depths. We must make haste." Lachlan drew the woman against his chest and nodded in the direction of the stairs. "A fire still burns in my chamber." Una raised an eyebrow. "This is not an injured bird or stay wolfhound you care for, but a grown woman." "Aye. Advise Marcail her skill as a healer be needed." He passed Una, climbing the stairs two at a time. She would not question his decision. He had always brought home stray animals and children found abandoned either through neglect of the cruelty of war. Una was ever the one he first looked to for help. He could hear Una wheeze as she struggled to keep up with him. She was growing older. He could make her days easier until the angel of death claimed her, but he would remain, as he always had. He looked at the lass he carried in his arms. She was as still as the marble statues that lay scattered about the temples of Greece. He drew her to him, hoping to share his warmth. At the top of the stairs Lachlan pulled open the door to his chamber. He entered and placed her on his bed. Una's breathing was labored as she came into the room and put her hand on his arm. "You will need to wait in the corridor while I remove the lass' wet clothes." Lachlan hesitated for a moment, reluctant to leave. He backed toward the door to the hallway. There was a reason the gods had brought her, but their purpose eluded him. Through the oaken panel door, Lachlan heard Una humming a tune so old the words had been lost over time. He took a deep breath and let it out slowly. Una must believe the woman would survive; if not, there would be silence in his chamber. Una was of the opinion that you let music into your life only when there was something to sing about. He trusted her instincts. The door opened as Una motioned for Lachlan to reenter the chamber. The woman on the bed cried softly. Worried, he glanced over at Una. She smiled. "All is well. The lass sleeps, and already her body has warmed. It will be some time before she awakens." The woman's garments were draped over Una's arm. "I fear her clothes are in such a tattered state that they are beyond repair. But I have never felt their like. The fabric is of the finest silk. The stitches so tiny and prefect, they are almost invisible. She must be a woman of great wealth. There is little more I can do." "I shall watch over her." He chose to ignore Una's smile.